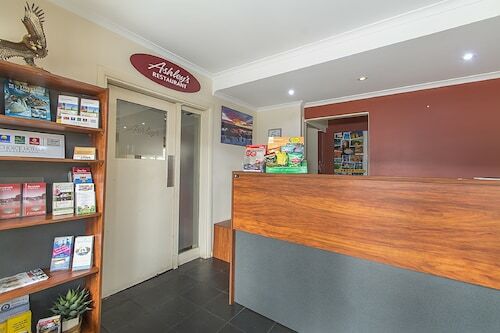 Situated in a shopping district, this motel is within 1 mi (2 km) of 23rd Street Distillery, Chaffey Theatre, and Renmark Visitor Information Centre. Jarret Memorial Gardens is 1.2 mi (1.9 km) away. 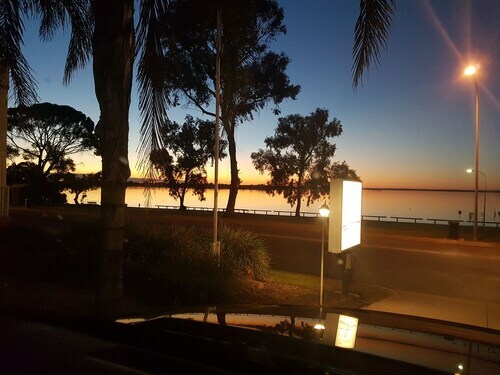 Situated on the waterfront, this hotel is within a 10-minute walk of Jarret Memorial Gardens and Renmark Visitor Information Centre. Chaffey Theatre and 23rd Street Distillery are also within 2 mi (3 km). Situated in Renmark, this motel is within a 15-minute walk of Chaffey Theatre and Renmark Visitor Information Centre. Jarret Memorial Gardens and 23rd Street Distillery are also within 1 mi (2 km). 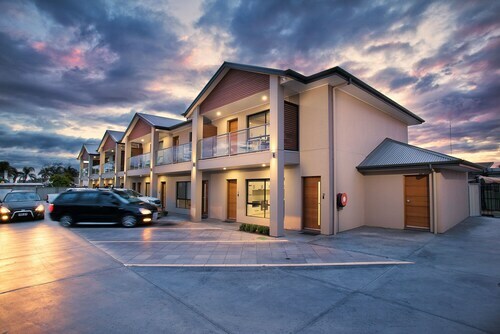 Situated in Renmark, this apartment building is within a 10-minute walk of Renmark Visitor Information Centre and Jarret Memorial Gardens. Chaffey Theatre and 23rd Street Distillery are also within 2 mi (3 km). Located in South Australia’s Riverland region, Renmark is near the Murray River and surrounded by rose gardens and historical sites, so unwind in one of our Renmark hotels. Slow down and smell the roses at Ruston's Rose Garden, the biggest rose garden in Australia. The fragrance is intoxicating and it will bring out the romantic side of even the biggest tough guys. If you find that the romance has been turned up a notch after visiting the garden, why not take your honey to see a play or catch a movie at the Chaffey Theatre? After that, you could take in the views and gaze at the stars, at the Renmark Township Lookout. 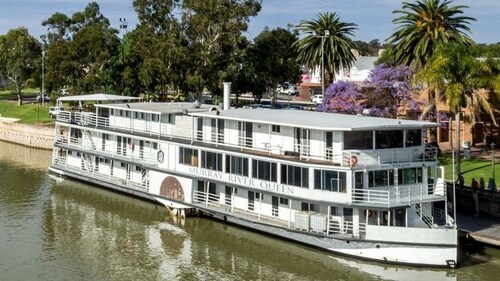 If you're here on the first Sunday of the month, you'll get to watch the paddle steamer, PS Industry, cruise along the river between 11:00am and 1:30pm. A holiday at the end of March will allow you to watch, or participate in, the Renmark Triathlon. Come in April and you can attend the Angove Family Winemakers' Market Day. Or, at the beginning of July, you can browse the Renmark Riverfront Markets. No matter what time of year you're here, you can always check out the Argo Barge, the Murray River's biggest barge. Although it's out of work now, you can see the barge, which was used in the 1920s, on the river's edge. If you'd like to learn more about the town's heritage, head to Olivewood History Homestead and Museum, home of some of the early settlers in the 19th century. On the other hand, art buffs will be fascinated by the bushranger ceiling mural at the Frank Harding Collection Gallery. To get to Renmark, you can fly to Adelaide with these cheap deals. The Adelaide Airport is about 260km away. If you fly in late, or you just want to explore the city for a couple of days, you can stay in one of our Adelaide hotels before heading to Renmark. You can catch a coach bus to Renmark, but you might want to hire a car, so that you can get around independently in town. If you do hire a car, it'll be easy for you to get to Loxton, which is only 42km away and is famous for its wine and its Christmas light displays at the Loxton Lights Festival. 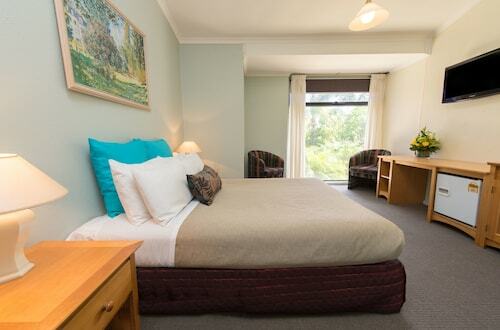 So, for a relaxing - or even romantic – holiday, book your Renmark accommodation now. How Much is a Hotel Room in Renmark? Hotels in Renmark start at AU$90 per night. Prices and availability subject to change. Additional terms may apply. Beautiful location. Good facitities and bistro area. 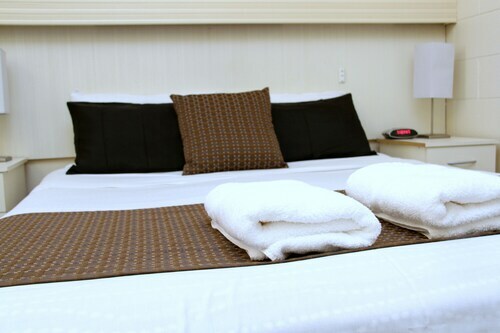 Some areas in our room could use a little tlc but overall good value and an enjoyable experience. A short walk to local shops and town centre. 2 days ago by A verified traveller from Adelaide, S.A. There were great views over the lake and staff were friendly and helpful. Check in was a breeze and the room was clean and comfortable. While meals were not served in the property, rooms were supplied with a microwave and toaster which made self catering our breakfasts really simple. There were some very nice places to eat within walking distance (Barmera Club and Barmera Hotel). The room could have used a new ironing board as the existing one had little padding, making it difficult to get a good finish on clothes. Overall, we had an enjoyable and relaxing stay and would recommend the motel to others looking for a break.